Super cool light cotton African style shirt in a range of bold artistic prints-a combination of tradition and modernity. 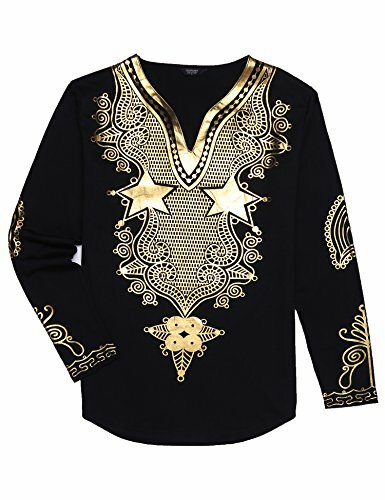 This fashion African shirt is a nice active performance shirt, definitely constructed for work, or casual. A nice and stylish long sleeve floral print shirt is a nice clothing for most of all occasions you like. Sleeve: 25.2" -- Shoulder: 18.4" -- Chest: 41.3" -- Waist: 39.8" -- Length: 29.3"
Sleeve: 25.6" -- Shoulder: 18.9" -- Chest: 43.3" -- Waist: 41.7" -- Length: 29.9"
Sleeve: 26.0" -- Shoulder: 19.6" -- Chest: 46.3"-- Waist: 44.7" -- Length: 30.5"
Sleeve: 26.4" -- Shoulder: 20.3" -- Chest: 49.3" -- Waist: 47.7" -- Length: 31.1"
Sleeve: 26.8" -- Shoulder: 21.0" -- Chestt: 52.3" -- Waist: 50.7" -- Length: 31.7"